Hello Everyone, I hope you had a great weekend? Last week I was busy with a big project. 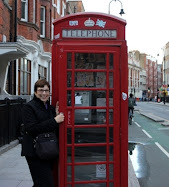 There was an Old Women who lived in a shoe in 1992. Sweetheart and she remodeled their kitchen and bought a beautiful convection/microwave oven. Over the years the microwave lost some power while reheating or melting liquids. Finally in 2012 the microwave blew its fuse and the fan and light stopped working. Now, I have a brand new microwave. There is more to the story about the new microwave. On Tuesday, sweetheart and I bought the microwave. Wednesday, sweetheart, a friend and I installed it over the stove. Good Job sweetheart! When installing the NEW microwave I noticed some grease on the copper molds above the stove. Something must be done! I think we need to wash the Cabinets! Yes! On Friday morning, sweetheart and I started washing the cabinets. I did the bottom cabinets and sweetheart did the top cabinets. I have always loved copper molds and have been collecting them for years. The clothespin was pinned to the napkin. I washed and washed and washed. This white beauty is my dish towel holder. He has been next to my sink since 1975. I have a new love. Cloches...Thank you Mary @ A Stroll thru Life I would have a cloche is every size and every shape. Collecting is great fun and I love to change things around in My French Country Kitchen. I found a copper chafing dish at a garage sale and scooped it up in a heartbeat. A little vignette of my Rooster Tea Pot with a sugar and creamer sits on my small table, and a small copper cup with a rose from the garden. My pillows add some french inspiration to my French Country Kitchen. The kitchen-dining room is large enough to entertain our family. When the table is open it will seat 12 people. I have a red and white vinyl tablecloth on the table to protect the wood finish. Since retirement, all sweetheart and I do is eat. Three meals a day. I have the salt, pepper and napkins on the red Lazy Susan in the center of the table so I don't have to keep getting up every time we need something. I see the word Lazy! On Saturday morning sweetheart mopped and waxed the floors. My version of a French Country Kitchen is now clean for the holidays. Our neighbor has a fig tree and gave me some figs. I love figs. Reminds me of the Mediterranean region. A Galette is a type of french pastry that is made with a rich, flaky crust, and traditionally served at Epiphany 6 January each year. I serve Fig Galette with triple vanilla ice cream and whipped cream in the evening for a late dessert. "Be fearless and love how you live. You're unique, and your home should reflect that." 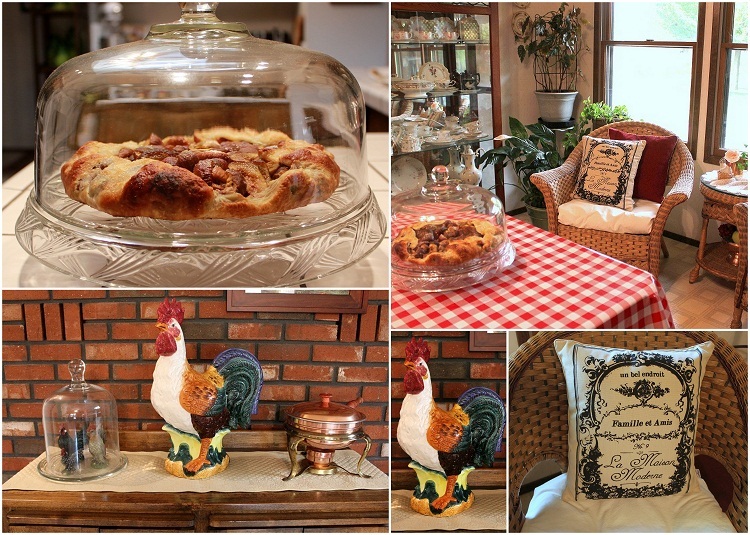 Thank you for visiting me at My Cozy Corner-French Inspired Country Kitchen. 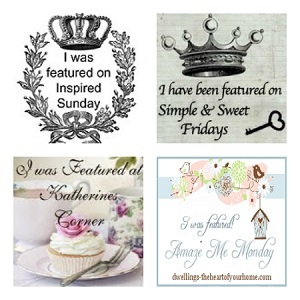 Join me as I stop by these blog parties this week. I know what you mean, my microwave oven broke down after 27 years! !...I even missed it, anyway, it too went to heaven and I got a fabulous one with the latest tech and all. I love your vignettes and I also love cloches and I have quite a collection, they're so beautiful, anything under them looks great, like yours. I love your country French kitchen too. The dessert looks yummy! Enjoy your Sunday. Nothing makes me happier than a clean kitchen. On the other hand, nothing makes me unhappier than having to clean it. Your kitchen is wonderful and the adjoining dining area is so cozy and charming. Enjoy that new microwave! One thing leads to another! How nice to have a sparkling clean kitchen. Your copper molds are a beautiful collection. And that fig dessert is calling my name!!! Oh how I need to deep clean my kitchen! Yours looks so pretty and clean! The fig dessert looks wonderful! I think I need to click and see how to make this! What a pretty kitchen. You will have sparked a continental kitchen-cleaning frenzy with this post! I really lovely post. Your kitchen looks fantastic. Everything sparkles - and thanks for the recipe - hope you link this to "Open House" on Friday! Cleaning my kitchen is on my list of things to do this week. So why am I sitting here reading blogs? Your rooster collection is fun! Shades of the past! 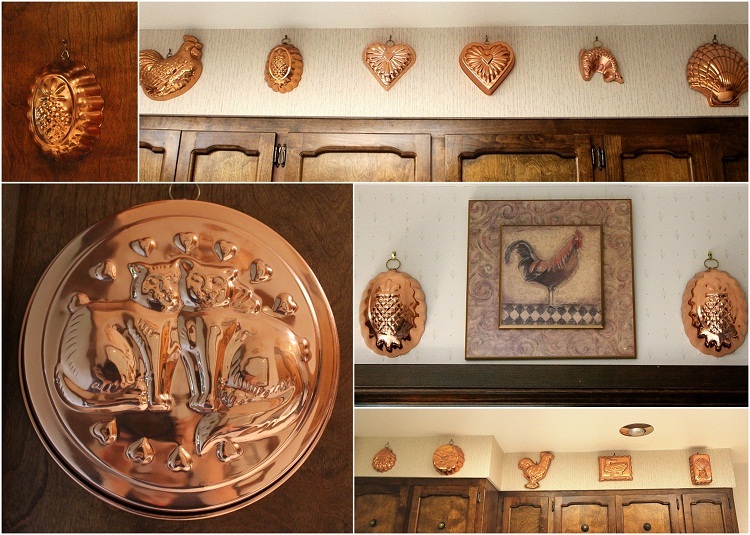 My Mom had copper molds up on her soffit around the cupboards when I was a kid! It is a timeless classic look and they can be so pretty! I get in the mood every so often and everything comes off the counters, get's cleaned, wiped down and back it goes! I like your rooster collection and the towel holder! Your kitchen does look perfect. The molds, cloches and vignettes are all wonderful. Thanks for sharing. Isn't it such a great feeling to really "clean" your kitchen?! I love your kitchen ... very warm and inviting! Your splashes of "roos" are fabulous! You make me want to go and clean my kitchen from top to bottom. Your copper collection is very nice. Your kitchen is so warm and inviting. I love the cushions and the sitting arrangement by the window. Your kitchen looks fabolous. pretty vignettes. This looks like the kitchen of my dreams. So cosy and familial. 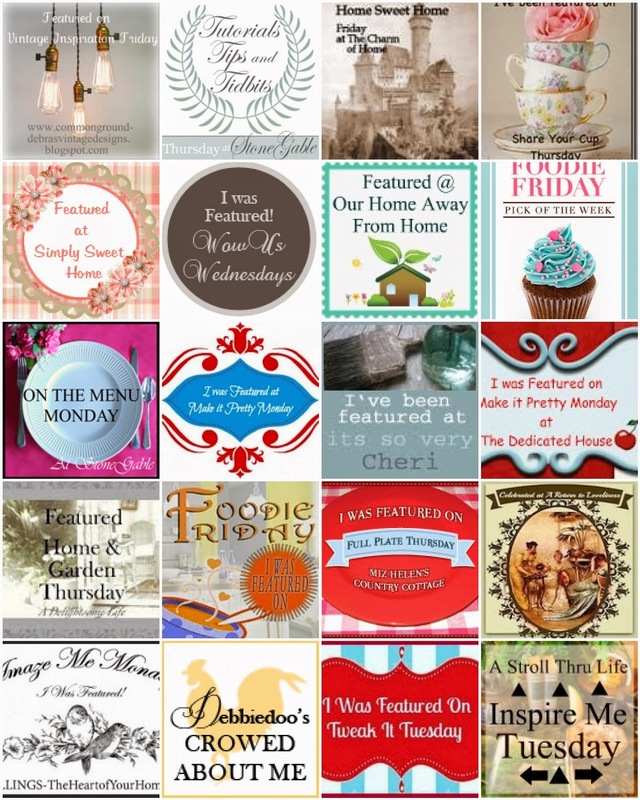 I so enjoyed reading this post and seeing the pics of your darling kitchen. I, too, love copper molds! I enlarged your pics so I could get a good look, and I have several of the same molds as you. I have the pineapple, heart, scallop shell, and sitting rooster, plus five or six others. I do love them in my kitchen. Believe it or not, we also have a copper chafing dish; we inherited it from my hubby's grandmother. Love your kitchen!!! I think I particularly like the comfy chairs on the side of the kitchen. I just want to pull up a chair. Great to have you be a part of Seasonal Sundays. Looking forward to having you with me this Sunday. Hi, I am trying to source the white ceramic dish towel holder. You said you had it since 1975. My mother-in-law had a similar bunny head and trying to locate one. Thank you. Wow! That looks so delicious and yummy. You presented it well and hope to learn how to prepare this food. Thank you. This could be me wanting to do one job and ending up with a workload. I'd like to be somewhere else, like in your cosy kitchen, at your table, eating a piece of your Frrench fig galette. Your dish towel rooster caught my eye! I have a duck I've used for the same purpose since the early '80s. Sooooo convenient, as you well know. So far it's hung in 7 kitchens. Your kitchen is sooo lovely..I want to invite myself to tea. Its very cozy. Hmmm... nice thanks for sharing this blog post.